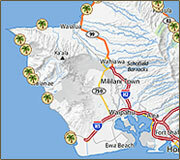 Explore the Hawaiian islands with our interactive maps. 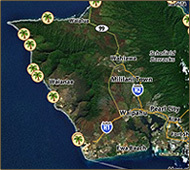 Find all the great beaches, attractions and activities and see the location of vacation rentals. Zoom in for a closer look and view the panoramic photos! Check out these exciting features and more. Title Bar - Lists the maps available. Click a link to change to another island. Tool Bar - Check box to show icons on the map. Uncheck box to hide icons. Click on a underlined attraction, eg. 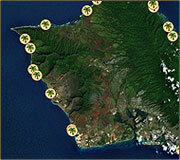 Beaches, and the map menu will show nearby beaches and their distances. Tip: By hiding some of the icons the map becomes less cluttered. The remaining icons will become larger and easier to click on. Start a Rental Search first and select an island. 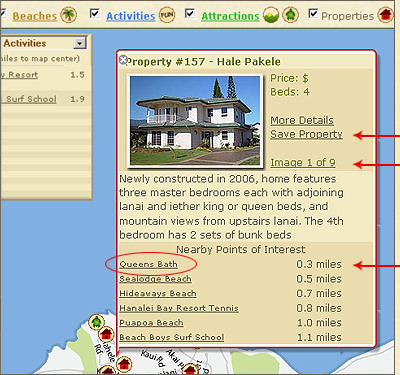 A list of properties will be displayed. This is the search results page. 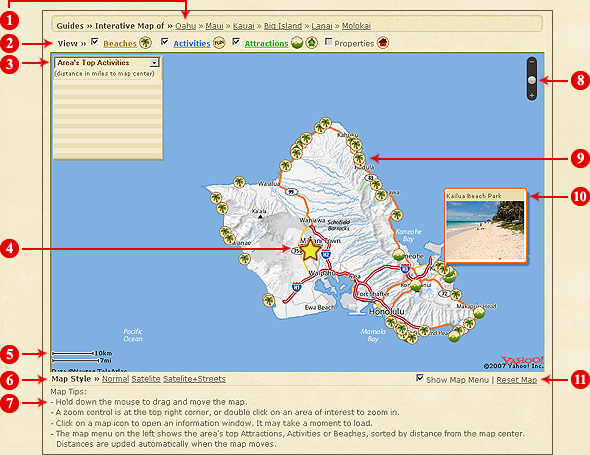 Click on "Map View" in the right hand corner. You will see the red house icons on the map now, see screenshot below. 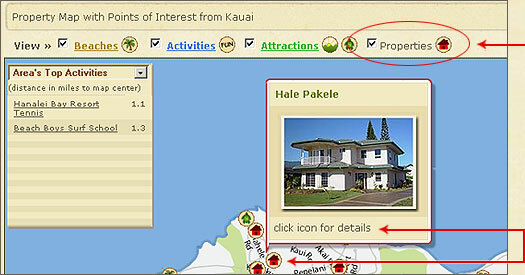 The properties checkbox is now activated. Hide all properties by unchecking the box. 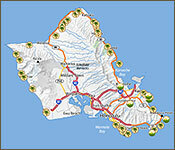 Map Menu - Lists the top nearby attractions or activities in the area or around a rental property. Distance is show in miles. Put your mouse over an item in the map menu and you will see the distance (in miles) and red line pointing to it on the map. The distance is calculated relative to the star, which is the center point on the map. Tip: Place mouse somewhere on map (not on an icon), click and drag. Dragging will move the map and star. Look at the map menu, the distances are automatically updated! Center Point - The star is the center reference point. e.g. The beach is 3 miles from the star. Map Scale - Gives you an idea of distances. Satellite imagery at maximum zoom is very good and gives one an interesting view of the surroundings. Keep in mind that the imagery is about 3 years old and doesn't show new construction. Tips - Tips on how to move around the map. Zoom Bar - Click to zoom in and out of the map. Icons - There is one icon for each beach, activity or attraction. 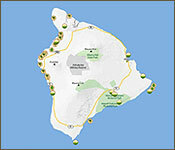 The icons show where it is located on the island. Click to zoom in. *When the exact address is not available, a property is placed at the town center (and grouped with others). 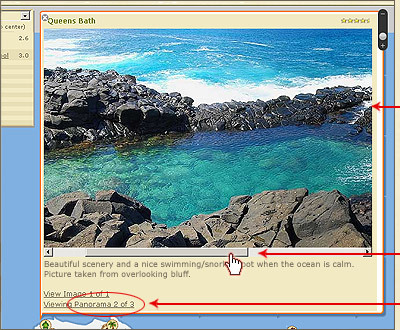 Photo Viewer - Place your mouse over an icon. A small photo of the beach or attraction will be displayed. Click an icon to view photos. There will be large single and panoramic photos. 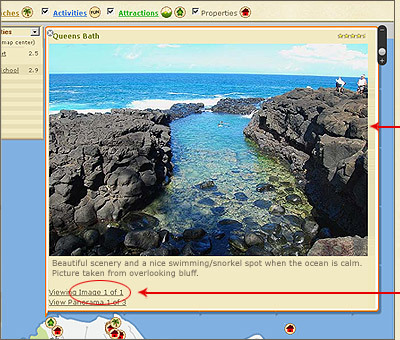 Go back to map feature #3 to view an example of the expanded window. Show Map Menu - Check box to show or uncheck box to hide the drop down menu. 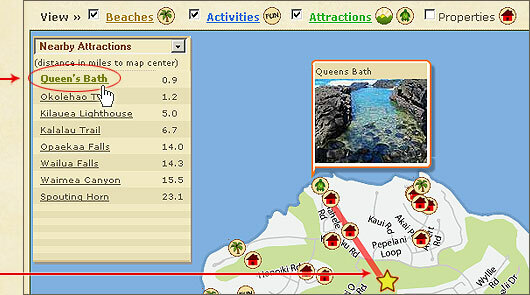 Located in the top left hand corner, this menu lists the top nearby attractions or activities. It is map feature #3 on the above screenshot. Reset Map - Resets zoom level. View the entire island and start again.